Are you looking for an alternative to a traditional chocolate advent calendar this year? How about one that means a yummy gingerbread biscuit every day in the countdown to Christmas? Then look no further! This is the first year that our eldest will actually “get” Christmas. He’s just been too young to appreciate it up until now (and he’s still a little too young to be too brainwashed by all of the adverts on TV – phew!) but we’re encouraging him to get into the spirit of things! And why not start with an advent calendar? 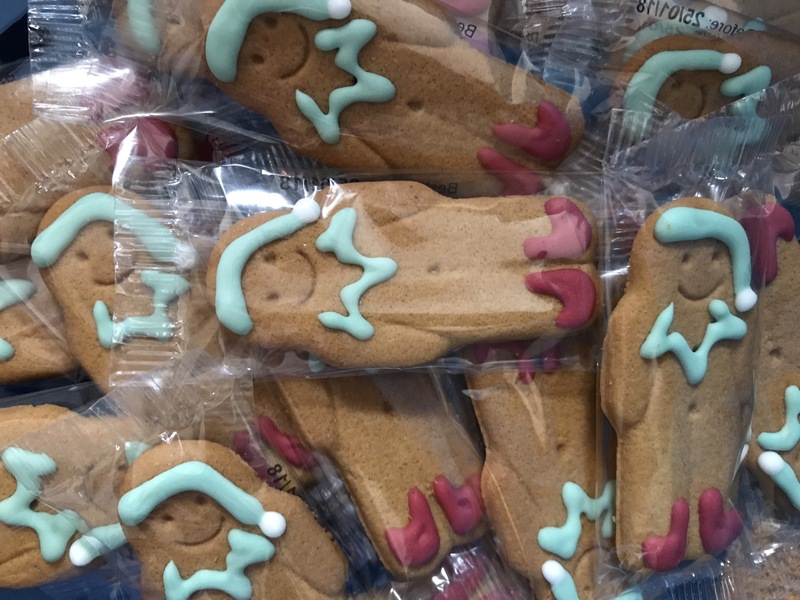 We’ve been sent the Elf & Seek Festive Countdown from The Little Treats Bakery (yum!) 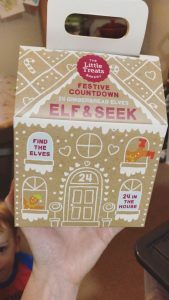 The box contains 24 individually wrapped gingerbread biscuits that you hide around the house each day, and your children (or partner…!) has to find them. And then gets to eat them. 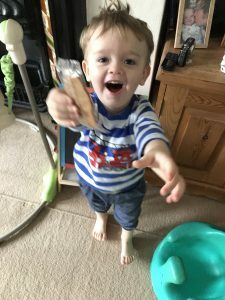 Our 2 1/2 year old is just about getting “hide and seek” as a concept, and it’s taken a couple of days for him to understand that it’s one a day, and there aren’t lots of gingerbread men hiding around the house for him to find…! We hid his first one under a pillow, and he was so excited to find it! He loves biscuits (particularly gingerbread, but any biscuits will do!) and bounded straight on over to me, gingerbread man in hand, and gave it to me to open for him, laughing his head off. I think it’s safe to say that he loved it! The next day, we decided to hide one in the tunnel of his train track. This one took a little longer to find, and he did need a bit of help, but the beaming smile when he found it was priceless. The biscuits themselves are delicious! No cracking on the icing or anything like that – that’s the sign of a well made, good quality biscuit in my book! It’s such a great concept, and adds a little bit of extra fun in the mornings! 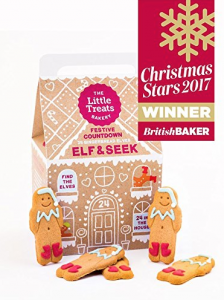 Enter the Rafflecopter below to enter the competition to win The Little Treats Bakery Elf & Seek Festive Countdown for yourself! Christmas Competition | Winner takes ALL! A log cabin holiday just before Christmas as we have to work on the holidays. Giving presents- I love it!!! Spending Quality Time with Loved Ones. I love the build up to the day, all the secrets and helping Santa out! The food and the movies! My favourite thing about Christmas is seeing my kids open their gifts. I love to see their excited expressions. How everything feels cosy, the curtains are drawn and the tree lights twinkling. Decorating the house and spreading Christmas cheer! Spending Christmas with my family and watching my 6 kiddies faces xmas morning, although they are getting older it will always be special. just love all being together watching xmas movies and scoffing our faces. I am looking forward to having 2 weeks off work to spend quality time with my family and friends. All the magic and excitement getting ready for Santa on Xmas eve with my little girl. I love seeing the excitement on my children’s faces, and spending lots of quality time with the family. I adore watching the excitement in my little ones face on Christmas Eve as he puts his plate of food out for Santa and Rudolph! Pure magic and memories I will never forget. Christmas Day is just so lovely. Seeing my loved one’s faces when they open their presents! Feeling rather stuffed after enjoying the Christmas dinner and relaxing. Excited little faces on Christmas morning when they discover Santa has been. The kids excitement, its contagious. Mulled wine, mince pies, cheese and spending time with the family! All the yummy food, and spending quality time with the family!